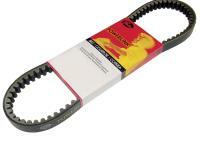 Gates Powerlink Premium CVT Drive Belt size 846-20-30. Poly Cord, Premium EPDM Construction. This belt is suitable for: TGB Delivery 150 (151cc) 2004-2007, TGB Laser R9 2006-2007, TGB Laser 303R 150 (151cc) 2004-2005, TGB Sunset 150 2007, TGB 150cc engine.